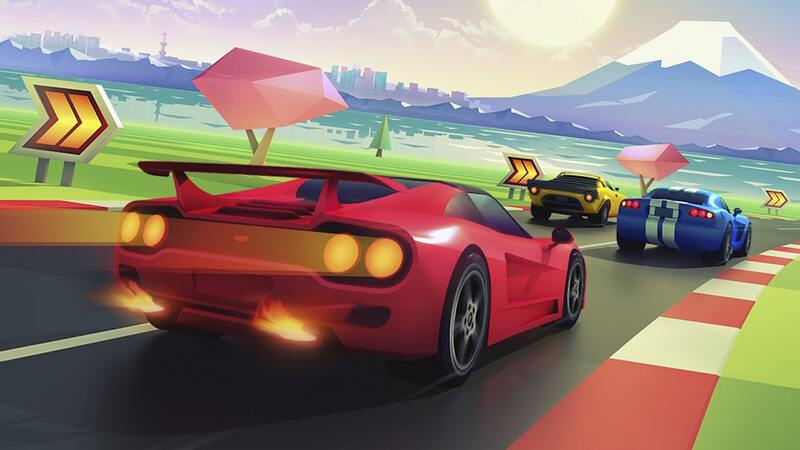 Horizon Chase Turbo is not OutRun, but it’s hard to know whether it wants to be. It certainly looks that way on the surface – flash cars chasing an ever-present horizon over the dashboard. Visually this arcade racer is modelled after probably the best arcade racer ever programmed. Each car is sleek and shiny, an easy extension for the racer’s ego. They’re throaty in sound which percusses catchy music to pair with the vistas that surround the seemingly endless highways. The similarities end there however. While SEGA’s baby is a simplistic, yet tight affair. Horizon Chase Turbo is deeper and broader, offering more than point to point racing. However, bringing many modes to the table does nothing if the racing itself isn’t fluid. It’s enjoyable, in short bursts, but longer play sessions begin to feel repetitive. Early races leave no need to brake into corners, there’s no drifting to be done and most races can be won with patience rather than skill. As the World Tour mode progresses, this lack of abilities beyond a Nitro boost, ensures the racing lacks any excitement. There are no gasp-inducing moments, no memorable corners. Each car feels similar despite having differing stats – they all barrel-roll and flip if you hit an obstacle at the side of the road and each vehicle shunts almost to a halt if you so much as graze another car. Which jars the experience, removing any option of wheel to wheel racing. Were these simply time trials, this issue would be moot. But you are often racing against nineteen other cars, vying for position on tight and winding roads. Yet there’s something enticing about playing. The developers drip feed upgrades to your car through one-off races – score above third place to choose an upgrade that’s applied to every car available – there are coins to grab on track which offer more points in championships and even fuel cans which become integral as the game goes on and you are required to manage your fuel consumption. Miss just a few cans and you can end up rolling to a stop before the checkered flag waves. Beyond the World Tour mode, there are Endurance races and tournaments, all of which offer new cars to unlock or ways to race. In fact, the most exciting aspect of Horizon Chase Turbo is the Playground mode. Within this menu the game will connect to the servers and conjure up a selection of limited time races that you can replay for better scores or times. Some races will simply flip the track so you’re racing in the opposite direction, whereas others bring in fully upgraded cars and ‘master level’ AI or changes to the weather as you race. This variety certainly asks more of the player and offers longevity beyond simply racing around the world. And the world is rather pretty, in a broad cartoon-like appeal. Environments shift from cityscapes to desert highways, constantly changing as you touch down in a new area. But, as with the original OutRun, the world ceases to truly exist beyond the boardings which highlight corners or odd signs. Each track generally feels like is has been dropped into a landscape, leaving all personality in the background. All of this makes Horizon Chase Turbo a bit of a frustrating experience. Where it excels is in ideas and concepts, yet it falters on the basic function of exciting racing. It looks and sounds good but lacks any memorable locations or tracks and it straddles an odd balance between pure arcade racer and pseudo-simulation, with its use of refuelling and permanent upgrades. And yet I finished the World Tour mode, knocked out some tournaments ready to write this review, but still find myself booting it up for the odd fifteen minutes and still thinking about how I’d like to chase a first place in every race. I’m obviously chasing something along with the developers.